Perspective maps are one of the oldest ways of presenting towns and area. In the 3rd.BC Euklides gave the first information about the rules of perspective, but in the times of Italian Renaissance, when Leonardo da Vinci explained the rules of air perspective, more knowledge on this subject was gained. Well known masters of painting and drawing, among others H.Van Eyck or Albrecht Durer, contributed to understanding the role of perspective. 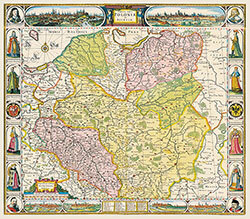 Many pictures - maps, particularly those from the 16th - 18th century became outstanding works of art. Charm and magic of old maps inspired Elżbieta Kuźmiuk, the founder and the editor- in- chief, to study geography and then to work on maps. Old maps and plans of cities initiated activity of this Publishing House in Warsaw. 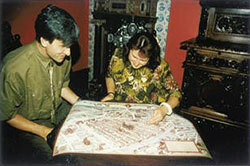 Ruben Atoyan, the Armenian born in Kirowakan was also an admirer and collector of maps. 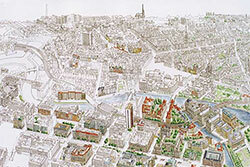 He studied cartography in Moscow and then he was developing maps in Erewan, Tbilisi and Minsk. 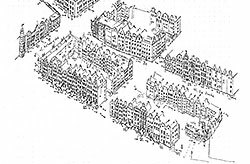 The paths of those two cartographers crossed in Gdańsk where in 1994 Elżbieta, as born Gdańsk citizen, wished to celebrate the jubilee of millenium of Gdańsk by editing panoramic map of her beloved town. There, in the collection of the old library, Ruben had chance to see the famous panoramas of towns in the atlas of Franz Hogenberg and Georg Braun, he could admire panoramas of towns of the world in the atlas "Civitas orbis terrarium" dated to the 1577. Those old atlases inspired him to develop many contemporary panoramic maps of towns and to edit in future the atlas of his authorship. Ruben joined the Terra Nostra Publishing House, and they developed series of panoramic maps of contemporary towns together. These maps are based on the old techniques. Every time before developing a panoramic map the artist should look through rich collection of old plans, panoramas and graphic art that are available in libraries and among collectors. From the maps developed by predecessors, he should depict the universal, remaining throughout centuries, character of the given town . Thus, the cartographer should look into many libraries, read piles of books, look through old maps and drawings, hundreds of aerial photos, many tens of sheets of topographic maps and meet many people - experts of architecture, art, and history of the given town. 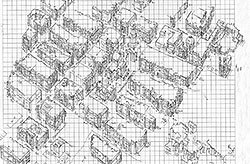 Developing perspective map means a complicated process demanding high qualifications and experience in descriptive geometry, cartography and drawing. As the basis of panoramic maps, landscape - artistic perception of spatial objects is used, which can be fixed on the surface by means of drawing and colour. While preparing the project of the work to be made, you should take into consideration size of the town, the lie of its land and possibility of its presentation at one B1 sheet, that is in size 100x70 cm. To choose the best option of showing the town's beauty, the artist with a plan in his hands gets to know its most important districts. Then he decides, what part of the town and from which direction it should be presented and it constitutes the most important stage of the project. After that, the line of the horizon is to be established. On our panoramic maps we usually accept the projection from 30 - 45 degrees from above the horizon. At last the depth of presentation of the drawing itself is determined. The "retro"style, that is panorama with elements of old ornamentation, which are characteristic for all panoramas of Terra Nostra Publishing House, demands blending new with old; so to say laying some patina on the contemporary image of the town. Ornamentation makes our panoramas look like the old ones, because they are based on the old technique of presenting views of towns. We wish to continue this tradition. Local historians and experts in art advise us what elements to choose for so called ornamentation. 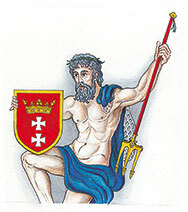 Most frequently they feature coat of arms of the town or its elements, important historical figures or architectural objects or history of the town. This choice is very important, because it makes each panoramic map unique. At the end of the first stage the outline project of the whole panorama is born and once it is approved the artist, according to it, develops the panoramic map. Finally comes the time to set out to town with a notebook and rapidograph. It may take several tens of weeks in sun and in rain, from dawn to dusk for the artist to walk along the streets and backstreets, he stops in front of every building and with unusual reverence reflects their image in great diminution. 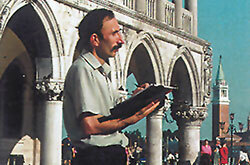 Armenian artist - cartographer sketches streets, canals and buildings of Venice. 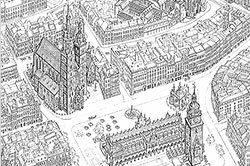 From among a few living artists, Ruben Atoyan has unusual gift of spatial imagination, so he could develop his own style of perspective sketching and presenting urban landscapes from bird's eye view. On the panoramas of this talented artist, we can admire all details which are precise as far as the horizon. At first two or three dimensional black contours or silhouetted sketches appear in his notebook. The most important elements of the drawing are the strokes, since the perception of the object depends on their thickness. The most important historical objects are thus drawn by thicker stroke to mark them off more clearly . Aerial pictures are sometimes helpful while determining shapes and colours of roofs and looking into the interior of the courtyards, but if you want to present the beauty of historic monuments and churches you should have them hand drawn from the proper perspective. Here is the example of San Giorgio Maggiore church in Venice. 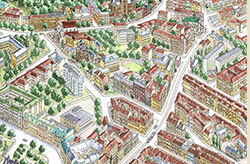 Since the panoramic map shows the town form the bird's eye view so the roofs of the buildings should also be seen. The artist has to climb to the highest floor of the highest building or the tower in the neighbourhood and sketch roof tiles, chimneys and sticking out aerials. He also initially determines colouring of the houses, busily noting on the sketches : here grey colour, there brick- red and somewhere else green. He faithfully matches these colours using watercolours. Elżbieta Kuźmiuk the editor of panorama helps the artist with his work on panoramic map. 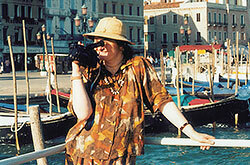 Elżbieta with the camera and film camera crosses the town, taking photos and filming streets, squares, houses, monuments and chosen architectural elements. From the highest buildings, from towers of churches, from balconies and roofs she provides documentation in the perspective and direction that was previously determined and agreed with the artist. She sometimes even knocks to private flats, to take a photo from the proper window. In result there are thousands of photos taken for the need of each panorama. Photographs and films provide the cartographer with the material that he later verifies to sketch precisely all the objects and streets. The editor's task is also collecting necessary information and materials, which are supplementing topographic map, current aerial photos, plans of the town, guides and photo albums. All plans of spatial and building development of the town are used. In this case talks with specialists and citizens of a given town are irreplaceable. Particularly precious are consultations with the experts in architecture, art, history and cartography. All of them have their share in presenting the accurate modern beauty of the town and depicting its unique character at the same time. We would like to say thank you to everybody, who has contributed to the unique character of our panoramic maps which have become precise documents of our times. Making perspective projection. 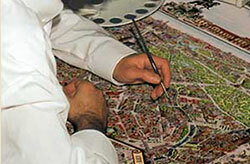 While developing cartographic presentation, various projections are applied. All traditional maps are developed in perpendicular projection. Sometimes three -dimensional presentations of single buildings or axonometric images of elements of urban landscape are met, like f.eg. 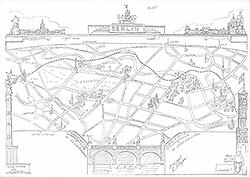 the maps edited by the renown German company Bollman-Bildkarten Verlag. Panoramic -maps of the Terra Nostra Publishing House, mostly drawn by Ruben Atoyan, are perspective maps with changeable scale - from the big one in the first plan to the small one in the further plan. This type of perspective demands spatial imagination, cartographic knowledge and artistic talent of cartographer. The artist usually chooses from three to seven plans - depending on the depth of the image. Gradual progression from further plans happens in stages and with the help of various graphic means like: reducing sharpness of lines, generalization of strokes, following patterns and omitting useless details. Elements of Panorama of Venice showing changeability of details on various plans depending on the depth of image. To show faithfully the image of contemporary town, the artist employs graphic effect that allows to widen streets and canals (f.eg. at the Panorama of Venice) so to uncover facades of the houses. This effect cannot be achieved by aerial photos. Using this technique we can look at the details in the town as if we were on the wings of a bird. We can look closer at the topography of the area, enter the narrow streets and see the town which from the three dimensional perspective looks differently than we used to know it. This technique in the future will give our maps the documental value, because the faithful image of historic objects as well as of all other buildings of the town will be preserved. 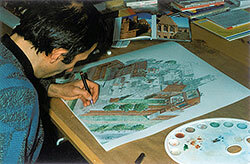 The artist prepares original drawing of the panorama in the scale 1:1 in relation to the map printed later. Ruben usually starts making the drawing from outlining its contour on one sheet of bristol board in the size 100cmx70cm. With barely visible lines, the first sketch outlining the future form, comes into being. At the topographic structure, most often in the scale 1:10 000, he gives clearness to contour lines, then he progresses in showing lighting of the form, and then highlighting its three-dimensionality. He puts all elements of the drawing in 0.13 mm thick rapidograph. 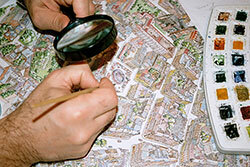 While drawing the details the artist frequently uses magnifying glass. To preserve all the details on the panoramic map of Cracow's Casimir the artist was supporting himself with magnifying glass. It is the most difficult stage of work, very arduous, demanding Benedictine patience and precision. It takes sometimes several months to make black and white drawing of panoramic map. Black and white version of the Panorama of Cracow. Having drawn all the elements with rapidograph, the drawing should be painted in watercolour. Black and white version of the panoramic map is slowly gaining its attraction. It is also arduous job, demanding accuracy and precision. All this process takes several months.. In the end, the original version of the map should be scanned, what has been a certain problem since the beginning of our activity due to the big format (B1) of the original drawing and great digital capacity of each panorama. Thanks to the technical talent of our graphic artist Wojtek Sobecki we manage to publish all the maps according to the author's recommendation. 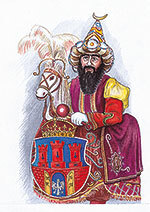 Descriptions of geographical elements, streets, monuments and other texts are separately computer designed. Each panoramic map requires about two years to produce, that is thousands of hours - first in the field, and then at the desk and computer. However, we are aware that our panoramic three- dimensional contemporary maps of towns are frequently the only ones and sometimes have been made for the first time in several tens of years. It is our wish, that each of our panoramic map was a nice souvenir. This artistic spatial vision sometimes brings us closer to the hidden beauty. However, don't throw away the old editions please, if you want to follow the changes that take place in these towns. Panoramic maps have chance to become valuable documents of our times. We will be grateful for all the remarks.